The MDP said it had received documents via email that appear to show Yameen is “equally involved” in the corruption involving his former deputy Ahmed Adeeb and the state tourism promotion firm Maldives Marketing and Public Relations Corporation. 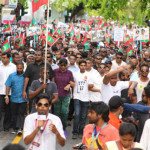 The main opposition Maldivian Democratic Party has called for the investigation of President Abdulla Yameen for alleged connections to what the anti-graft watchdog has called the Maldives’ biggest ever corruption scandal. 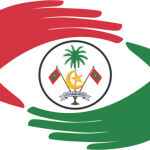 More than US$205million received by MMPRC was “distributed to other private companies through illegal means,” according to the documents shared over email, the party said. The beneficiaries is said to include MPs and top government officials. 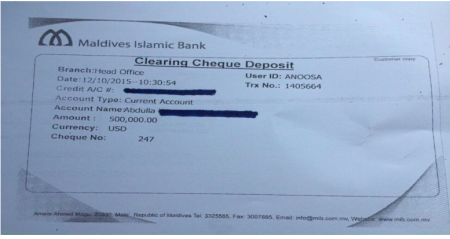 The MDP also published a picture of a deposit slip that appears to show some US$500,000 was deposited to an account under the name of Abdulla Yameen Abdul Gayoom at the Maldives Islamic Bank on October 12. All the documents were submitted to the police for investigation on Saturday, the party said. 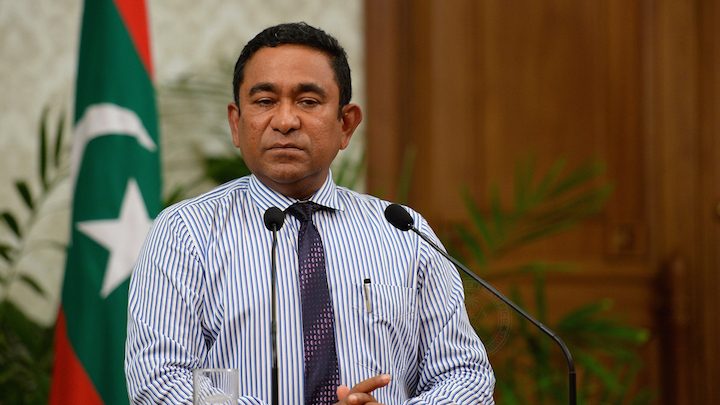 Yameen has sought to distance himself from the scandal, with police and public prosecutors pinning the blame on Adeeb, the former head of MMPRC Abdulla Ziyath and influential businessman Hamid Ismail. The three are now standing trial on corruption charges. The allegations first surfaced in a 2014 audit report, which only ended up costing Auditor General Niyaz Ibrahim his job. Then in October last year, when Adeeb was arrested on suspicion of links to a blast on the presidential speedboat, Yameen publicly accused his deputy of using MMPRC funds to bribe the police and military. He ordered the Anti Corruption Commission and the new Auditor General to launch an investigation. The reports are yet to be released. But media reports indicate that several MPs and ministers had benefited from the MMPRC scam. 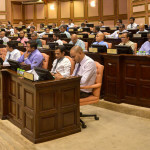 MP Riyaz Rasheed, deputy parliamentary group leader of the ruling Progressive Party of the Maldives, also appears to have benefited, the MDP said. Some US$300,000 was deposited to an account under his name. “There appears to be many other transactions of this nature involving the names of top state officials. An investigation is required to uncover the truth and clear the names of officials,” the statement read. Speaking to The Maldives Independent, Rasheed said the allegations were “nonsense.” Neither the ACC nor the AG office had questioned him yet, he said. 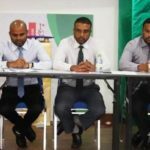 The MDP also expressed concern alleging that no MMPRC board member has been questioned over the scandal yet. Local media have also alleged that companies affiliated with PPM MPs Mohamed Musthafa, Hussain Manik Dhon Manik, MDP MP Ahmed ‘ADK’ Nashid, and Home Minister Umar Naseer were awarded islands or lagoons without due process. 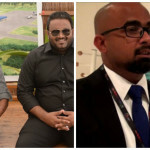 Musthafa and Dhon Manik have dismissed the allegations via tweets, while Naseer in an interview with news website Avas said the government was following “legal channels” in leasing a lagoon to his submarine tour company. Tourism Minister Moosa Zameer said the government would honour all contracts. Former AG Niyaz has raised doubts over the ACC’s ability to conduct a thorough investigation, claiming the watchdog has been paralysed because of a systematic crackdown on watchdog institutions. Opposition parties are planning a march against corruption on February 5.